So-called “Safe and Accurate Food Labeling Act” would overturn state and local laws requiring GMO labeling, denies consumers their right to know what’s in their food. U.S. Rep. Tulsi Gabbard (HI-2) and five other lawmakers hosted a press conference today to encourage Members of Congress to vote no on the DARK Act. 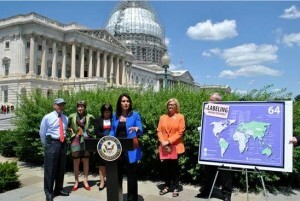 Washington, D.C. (July 22, 2015) — Today, Reps. Tulsi Gabbard (HI-02), Peter DeFazio (D-OR), Nita Lowey (D-NY), Rosa DeLauro (D-CT), Earl Blumenauer (D-OR), Peter Welch (D-VT), Chellie Pingree (D-ME), and Ann McLane Kuster (D-NH) condemned the industry-driven Safe and Accurate Food Labeling Act, also known as the Deny Americans the Right to Know (DARK) Act. This legislation would overturn state laws requiring labeling of foods containing genetically modified organisms (GMOs) and would deny consumers the right to know what is in the food they consume. Although 90 percent of Americans support the labeling of food containing GMOs, there is no federal policy in place to label such foods. Three states—Vermont, Maine and Connecticut—have passed laws requiring GMO labeling, and over 30 states have considered similar legislation, including Hawai’i. The bill would preempt states’ laws on GMO labeling and codify the current broken system of voluntary labeling. In addition, the bill would create even more confusion in the marketplace by requiring the Food and Drug Administration (FDA) to allow misleading ‘natural’ claims on food products containing GMOs. Sixty-four countries around the world already require the labeling of GE foods, including all the member nations of the European Union, Russia, Japan, China, Australia and New Zealand.